Get Mother what she really wants this Christmas! Colt, the horse... not colt, the gun. Santa should stay away from the eggnog until after Christmas. Reminds me of one of my favorite Christmas songs, Weird Al's The Night Santa Went Crazy. 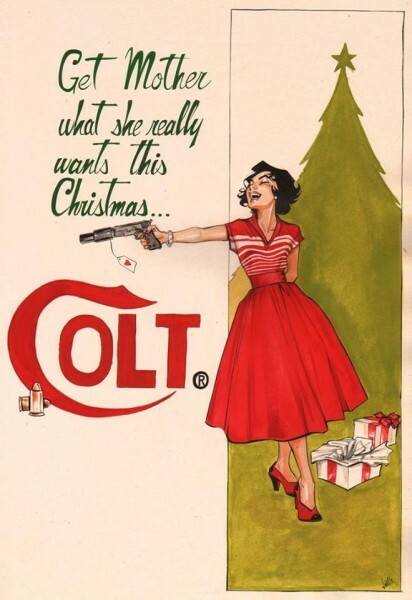 Notice the close-up of the Colt label on his rifle: product placement for the win! LOL, I've never wanted either a Colt or a colt in all my days. In my younger days, I used to be fairly deadly at shooting cans off a fence rail with a .22, and can stay on the back of a mellow, well-trained horse that's not actively trying to ditch me, but that's as good as it gets. Good gracious re: song, Elen! :P It's certainly very subversive... And yes, a very prominent product placement, that's for sure. There was a time in my life when subversive Xmas songs were my best defense against the Spirit of Christmas Past. Christmastime In Hell from South Park is another cheery one.